We want our children to enjoy sports safely. These tips to prevent children’s sports injuries will help parents prevent the most common injuries we treat. There is nothing quite like the pride parents feel watching their child score a game point, execute a crucial pass, and thrive in the teamwork that organized sports teaches. Children’s sports provide wonderful opportunities to develop social skills and establish the active habits that lead to a healthy lifestyle. As we celebrate our children’s victories, we also want their participation in organized sports to be safe and healthful. Any child can suffer an injury on the field, but these tips to prevent children’s sports injuries will help parents identify common sports injuries that are both predictable and preventable. Make a preseason physical examination part of your routine. When your child is in good physical condition, the risk of injury drops. It is also a good idea to discourage children from competing when they are very tired or in pain. Choose well-organized sports run by certified athletic trainers. Look for programs through schools and community clubs that actively demonstrate a commitment to injury prevention. Coaches and staff should include certified athletic trainers with proven first-aid and CPR skills. Confirm that rules about safe equipment use are enforced, and that the organization has a plan for responding to emergencies. Supply your child with proper safety-certified gear. Helmets, guards, and sport-specific athletic shoes are designed for your child’s protection. 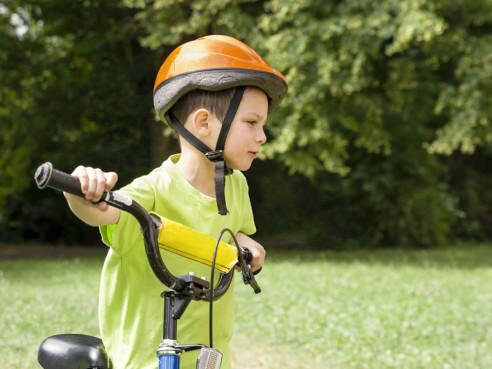 Don’t allow your child to use a hand-me-down helmet unless it fits properly and has been recertified for safety. Confirm that warm-ups and cool-downs are part of your child’s sports routine. Warm-up exercises make muscles and other soft tissues warmer and more flexible. Some training exercises are designed to prevent or reduce the incidence of injuries such as ACL damage and concussion. Cool-down routines loosen muscles that tighten during competition. Encourage your child to stay hydrated while playing. Children are particularly susceptible to heat-related illnesses, which can be very dangerous. Make sure your child uses sunscreen. Sunburn can sneak up on a child. Sun protection helps to safeguard your child against damaging his or her skin now, and reduces the risk of the skin cancers that can occur later in life. Learn the safety rules for your child’s specific sports. Safety rules are developed to anticipate and prevent injury. Encourage your child to respect and follow the rules of the game. We can’t protect our children from every risk, but following these guidelines can reduce your child’s risk of common sports injuries. A little precaution and prevention will help keep youngsters in the game, developing the confidence and fitness that will help them reach their personal summits for a lifetime. Does My Child Have A Fracture?